National Player of the Year candidates headline all-star lineup headed to Chicago, but no Nerlens Noel. Dueling National Player of the Year candidates Kyle Anderson of St. Anthony (Jersey City, N.J.) and Shabazz Muhammad of Bishop Gorman (Las Vegas) headlined Thursday's announcement of the rosters for the 35th annual McDonald's All-American Game. The showcase will take place March 28 at the United Center in Chicago and will be broadcast live by ESPN. Tip time is slated for 8:30 p.m. Central Time, with the girls contest on ESPNU preceding the boys at 6:30 p.m. Central. Anderson, a 6-foot-7 point-forward, has established himself as one of the biggest winners in the Class of 2012. 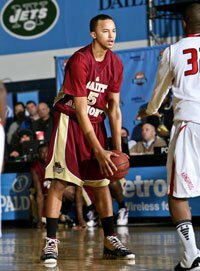 The UCLA pledge has helped St. Anthony and Paterson Catholic go 78-1 on the court over the past three seasons, winning a national championship with the former in 2011. He has also experienced success on the summer circuit with the New Jersey-based Playaz. Muhammad, a 6-6 wing, is the No. 1-ranked prospect in the MaxPreps Class of 2012 Top 100. He is in the midst of an ultra-productive senior season, pouring in nearly 30 points per game while collecting close to 10 rebounds per outing. 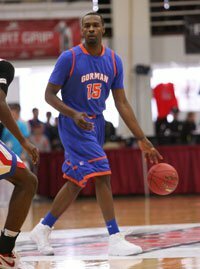 He expects to make his college decision in April, deciding between Arizona, Duke, Kansas, Kentucky, UCLA and UNLV. Four Texans are headed to the Windy City, one short of the record for a single state set by New York and California in 1980 and 1997, respectively. Seven-footer Isaiah Austin of Grace Prep (Arlington), 6-10 Cameron Ridley of Fort Bend Bush (Richmond), Marcus Smart of Marcus (Flower Mound) and Rasheed Sulaimon of Strake Jesuit (Houston) are the participants slated to represent the Lone Star State. All four will suit up for the West squad. Like the field for the NCAA Tournament, McDonald's All-American selections are highly scrutinized each year. The biggest question for the committee this season will be Nerlens Noel, a 6-10 shot-blocking whiz from Tilton School (N.H.). Noel recently reclassified as a senior and has already been installed as the No. 1 2012 prospect by some media outlets. He publicly stated a desire to be included in the storied contest. The McDonald's All-American Game is the nation's top postseason showcase for seniors. Teams were picked from a field of 600 nominees by a selection committee chaired by Hall of Fame coach Morgan Wootten. More than 1,000 players have competed in the event since 1978, including Michael Jordan, Magic Johnson, Kobe Bryant, Kevin Garnett, LeBron James, Dwight Howard, Kevin Durant and Derrick Rose.